I've recently read two books with roots in my teen years - John Wyndham's The Chrysalids, which I read for my grade 10 English class, and Andre Norton's The Chrystal Gryphon, which I hadn't read before but whose characters I at one time felt I knew intimately. I'll discuss the Norton book later in the week; in fact, let's call this Nostalgia Week at Bookphilia; I'm sure I can come up with a third book to round it out. It's been 20 years (!!!) since I read this novel and I've been haunted by the image of Sophie's 6-toed footprint on the rock by the river ever since. I've read a lot of dystopias in my day - indeed, high school English was defined almost entirely by dystopias such as this novel and The Handmaid's Tale, Brave New World, Animal Farm, 1984, Fahrenheit 451 (although I skipped this last one, for some reason; I have heard, however, that it's a pleasure to burn). Except for The Chrysalids, which affected me most, I've read all of them more than once. It's dangerous to go back to childhood/youth favourites. Sometimes they don't stand up at all. Sometimes what seems scary and cool turns out to concludes with really embarrassing Hallmark schlock (A Wrinkle in Time), or is both racist and sexist (Goonies, dammit! and Barometer Rising), or is just plain annoying (Lord of the Flies). What I'm saying is, it's been 20 years since I last read The Chrysalids because I was nervous. Well, the news is mixed. I enjoyed it and it turns out I'd actually forgotten 90% of it, so I spent a great deal of time being edgy and nervous about what would happen next. But it was so...pat in its ideological slant. Religion = bad and retrograde and cruel! Tribalism = stupidity. Never mind that the culture he represents here developed out of an attempt to survive! It's pedantic. I would suggest that most dystopias are but 1) I realize this is probably a result of tautological thinking. 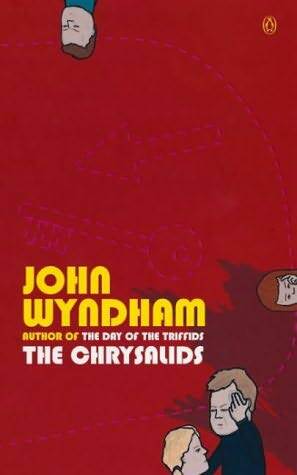 The Chrysalids read to me as though it were produced for high school students specifically, but given that it and other books like it defined my high school experience, how else could it read to me now? 2) The dystopic aspects of say, David Mitchell's books (especially "An Orison of Sonmi-451" in Cloud Atlas) or Yevgeny Zamyatin's We don't read "high school-ish" at all. These are sophisticated pieces, Mitchell's work especially, and thus terrifying to the more subtle and hopefully realistic sensibilities of the adult mind. The Chrysalids, well - what could resonate more with 15- and 16-year-olds than being harassed by adults because you're different, man? That said, The Chrysalids is perhaps more complex than high school English teachers allow it to be for their students. David, Rosalind, and Petra have only one chance for survial once their telepathic powers are discovered - rescue at the hands of the "Sealanders" Petra is able to contact from the extreme distance of Labrador. They are rescued at the eleventh hour but their escape depends upon the Sealand woman and her crew killing everyone on the ground. This is casually dismissed as a necessity based on an "If you're not with us, you're against us" mentality - one which I found equally disturbing in The Matrix for in both cases, the so-called enemies don't know they are trapped, that they are ignorant and are pawns in a larger ideological struggle leads to not one iota of sympathy, never mind a different sort of strategy. They think their perceptions are real; they are wrong, perhaps, but they aren't inherently malevolent. More importantly, the Sealanders take pains to distinguish themselves from the Old Ones who clearly brought on the earth's near destruction through their technological greed. Yet, the Sealanders' technologies are almost exact replicas of the world that would have been current when Wyndham was writing this novel (early to mid-1950s), and which are the source of this anxiety over impending nuclear holocuast - fuel-powered automobiles, electricity, and machines and chemicals for killing those who get in yer way. The only difference in the new world from the world of Old Ones is that many people can communicate without opening their mouths. I don't think, in other words, that we're supposed to see David, Rosalind's, and Petra's rescue as an unqualified happy ending; at least, I hope we're not. They're going to a world in which the only difference between that which has made all these birth defects so rampant and the new world is the possibility of establishing a highly efficient hive-like culture through most being able to think together. In other words, Wyndham creates a world in which the mid-century possibility of nuclear disaster is just as real as it was before, and in which a sort of communism arising quite naturally out of this common and celebrated defect of telepathy is even more likely. In any case, history seems likely to be repeating itself in Wyndham's post-nuclear holocaust world. Which brings me to Cloud Atlas (again). When I re-read this novel recently, I noticed how much literary heritage is bound up in the telling of that story. 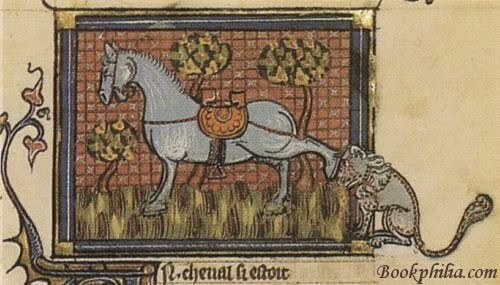 Based on the 10% of The Chrysalids I remembered, I was certain that it was part of what went into the section "Sloosha's Crossin' an' Ev'rythin' After"; now that I've re-read The Chrysalids, I'm even more convinced. This section of Cloud Atlas is in no way derivative, though; rather, it reimagines the consequences of the Old Ones' choices in a much more subtle way - and of course, there is no possibility of rescue. The fairy tale fantasy of rescue is denied and what is doomed to recur, tragically, isn't necessarily nuclear devastation - rather, it's the forgetting, and the loss of humanity that entails, preceding such disaster that is doomed to repeat itself. If you know of any recent and super-excellent dystopias - dystopias which aren't invariably steeped in outdated fears of nucelar war and commies, but like Mitchell's Sonmi speak to a contemporary threat (the corpocracy - my god, I find this idea terrifying!) - let me know! In the meantime, I'll be thinking of The Chrystal Gryphon and looking for another work for Nostalgia Week. I haven't even heard of either of these books! Although I'm surprised you didn't read Fahrenheit 451--I expected it to be dumb, but it was surprisingly decent. Way back in the old skool, anyway. I think if you walked blindly into any YA section of bookstore blindfolded and randomly grabbed a book, you'd have a 30% chance of grabbing a dystopian novel (the other 70% is vampire-related). I read The Adoration of Jenna Fox and that was pretty good--it really makes you think. The Hunger Games is INSANELY popular (I haven't read it yet), and Life as We Knew It is another dystopian novel that a lot of people give good reviews to. But really there's a whole slew of them out there right now. Sarah: I don't think my flip throwaway comment about difference is the only reason it appealed to our teenage selves. I think dystopias are inherently interesting because they express so many unspoken, unacknowledged cultural fears even as they express the obvious ones. And I think Wyndham was a pretty good writer. heidenkind: I'm annoyed that I didn't read Fahrenheit 451. I've seen the terrible film in the past year or so and am certain I would have liked the book too; it has all the right elements - books as a secret pleasure especially! You might be right about what's to be found in YA sections, although at least one person I know is writing great Victorian girl detective fiction...! I looked at The Hunger Games this weekend but think I'd like to read Patrick Ness's The Knife of Never Letting Go as my next YA read...Someday! I just read The Hunger Games this weekend--and while it was definitely young adult, it seemed anything but childish. It's a quick read, and gripping. AND the final book comes out in a month! And suddenly I understand why I like dystopias! I just read Knife of Never Letting Go expecting great things, but it just didn't work for me, not entirely sure why. Partly couldn't get over the dialect. I'll be really interested to hear what you think. How about a utopia for a change? Ecotopia is my favorite cheesy nostalgia science fiction. It's barely literature, but I LOOOOVE it. I'm still waiting for extruded houses. I love the idea of 'nostalgia week.' I've been thinking a lot about a novel that used to be my absolute, no questions asked, hands-down favorite, Gone with the Wind< with an eye to rereading it and then writing about it. I'm kind of afraid to, though, in case to my grown-up self it is just an awful book! Maggie: In my opinion, the best YA lit doesn't read "young" - I'm thinking, e.g., of Margo Lanagan's Tender Morsels. That's a good endorsement for The Hunger Games! Trapunto: "I'm pedantic!" Me too, actually. I really like the first page of The Knife of Never Letting Go, but haven't tried to get beyond that. Maybe soon! Ecotopia - I will look for it and subject it to the page 40 test! Rohan: It's strange how some books translate so seemingly into the lexicon of our adult reading lives and how others so completely fail to do so. It is a risk, but I think an engaging exercise in measuring our own reading "evolution". But painful, sometimes, absolutely. Though there was no such thing as YA at the time ( God but I'm old) Ray Bradbury's Something Wicked This Way Comes was one of my favourite books as a teen. If it came out now I'm pretty sure it would be on the YA bookshelves in shops. I'm afraid to re-read because it would hurt my heart to discover it had failings.